In our continual effort to drive an industry dialog on ROI, Shop! is pioneering the development of industry standards for ROI for both In-Store Marketing Materials and Store Redesign projects. This white paper examines the interrelationship between store environment, shoppers, and the retail employee. The paper shows the key factors/influences on customer experience in the retail environment, on the employee experience and its impact on customer experience in the retail environment, and of store design and how they affect the employee and customer experiences and ultimately return on investment (ROI). 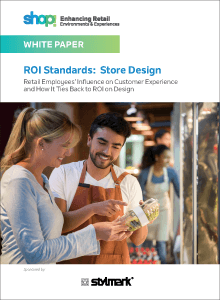 This 40-page document includes guidelines for developing in-store marketing materials, improving compliance and calculating ROI. Find actionable insights, best practices and templates to help produce effective materials and increase ROI. While focused on P-O-P Displays, the learnings are applicable to all in-store marketing communication vehicles. The white paper offers actionable insights, case studies, and best practices based on the findings of our recent studies. The takeaways will help companies justify their investments to create and execute successful store redesign projects that ultimately enhance the retail experience for shoppers. For more information regarding these or other reports, please contact Madeline Baumgartner, Shop! Director of Education & Research at mbaumgartner@shopassociation.org.